A 58 year old Ethiopian male presents with pulmonary edema, and fever. The clinical symptoms were suggestive of pulmonary hemorrhage. An iron stain was requested on broncheoalveloar lavage. Strongyloidiasis is caused by the parasitic nematode Strongyloides stercoralis. 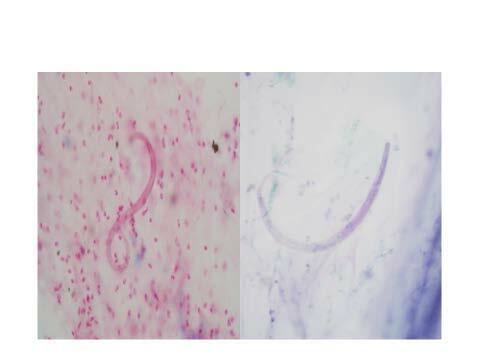 The lifecycle of Strongyloides is complex, and multiple life stages of the parasite can be seen from human specimens. The infection begins with penetration of the filariform larvae into the skin of the host. During the initial few days of the infection (the cutaneous phase), the host will develop a pruritic rash at the site of entry, and larvae can be found in the skin. At approximately 1 week into infection, as in this case, larvae can be located within the lungs or tracheobronchial pathways where they cause dyspnea, hemoptysis, and asthma like symptoms as they migrate to the intestinal tract. Once they have migrated to the gastrointestinal tract, they molt to the adult stage. Symptoms of the gastrointestinal tract can be nonexistent, or can mimic inflammatory bowel disease. Gram, GMS, PAP, Diff-Quik stains can all be used to detect Strongyloides. There are two major pitfalls in the diagnosis of Strongyloides. First, there are many potential non-parasitic mimics of nematodes including plant matter, food, and fungal spores. Histologic identification of a parasitic nematode requires visualization of internal structures such as the digestive tract. Additionally, once it is determined that a parasite is present in the sample, identification can be difficult. Specifically, it can be difficult to differentiate strongyloides from hookworm. Although there are some similarities between the rhabditiform larvae of Hookworm and Strongyloides, the buccal capsules are smaller, and the genital primordium is larger in Strongyloides.